I’ve been meaning to review this for ages but Loki is such a fan of it he keeps squirrelling pieces of it away in his nests and I can never find the whole set for a proper photo! I’ve finally managed to get it all in one place; the bathroom and I was glad I did because all 3 boys had great fun with it! The Gumigem Pirate Bubba Bag is a fab addition to our house. Silicone teethers and toys for all ages from birth to enjoy. I’m on my third boy and we’ve gone through our fair share of teethers over the years. I’m happy to report these pirate themed goodies are genuinely fab. My current toddler tornado Loki is 2 now and has a mouth full of teeth with his big back molars ready and waiting to poke through. I’ve offered him lots of different teethers, (I have 8 years worth now) and when you add rubber dog toys too he’s got a plenty of options. Disturbingly, biting my kneecaps and/or a random toe is apparently far more preferable. The ship’s wheel is my favourite and arguably Loki’s favourite. It’s brilliant! It is a great size, really chunky and the knobbly bits on the wheel get right to the back teethies that most teethers (or toes) fail to reach. From the moment I shoved it in his mouth it’s been a hit. Loki is out of the let’s-try-and-eat everything phase (thank goodness) but when his teeth are on the move it’s a tough time for everyone involved. It’s great to have a handy bag full of safe toys for him to literally get his teeth into. The past few bath nights we’ve had the set in the bathroom and all 3 have enjoyed playing with them. The spy glass is huge and perfect for blowing bubbles and water in a siblings face! 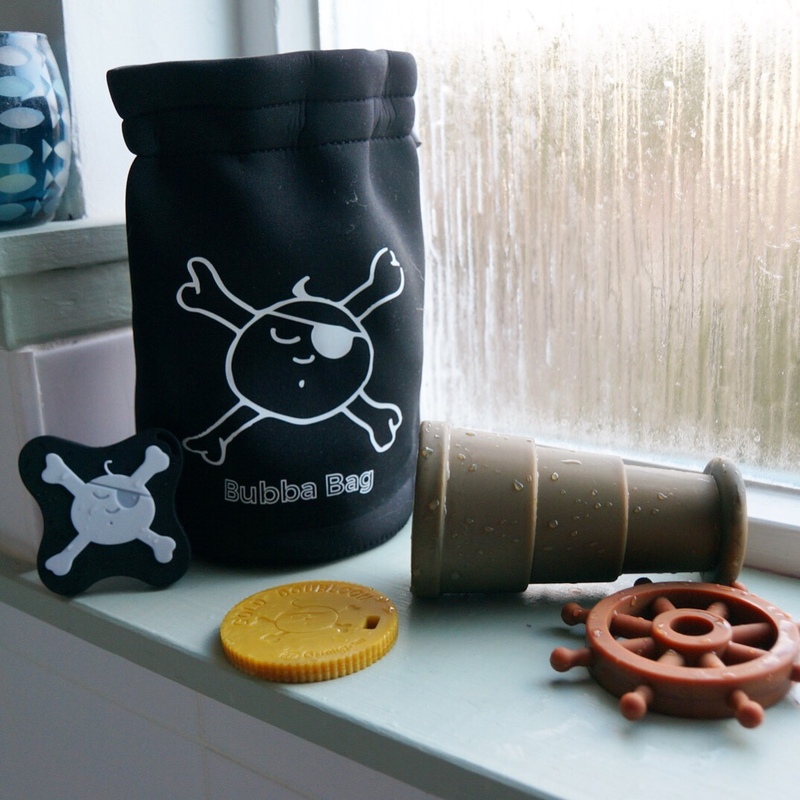 The coin, wheel and skull and crossbones pieces are great for hiding beneath the bubbles and working on those toddler skills to locate and retrieve from the bottom of the tub. All the Gumigem toys in this Bubba bag can be put through the dishwasher which is frankly amazing. I’m much less precious now if the dog gets hold of one of them because I can make sure they’re thoroughly cleaned afterwards! The pirate coin or debloon is Oren’s favourite. It has lovely details on it too. He is 6 and a wee magpie for shiny things. The coin has a hole so you can attach it to a clip, safety chain or tie a ribbon on it to keep it safe. Oren has opted to use it to go “fishing for treasure” – he’s been having loads of fun with it. Oren and Loki love rooting in the bath or the bucket for the treasure. The bag is great for handy and portable storage when out and about. It’s also great for a spot of things into things which is still one Loki’s favourite things to do. So far we’ve used the set in the bath, in the garden (for a spot of hide and seek), the dog has had a good play with each piece (sigh) and we’ve also used them with play sand in our sensory tray. We took turns burying the pieces and then raced to find them all again. The fact that the pieces are so robust makes it a really versatile set. They’re a great size, nice and tactile and so easy to clean, which is reassuring after all of the places they end up! Also I want to add, we’ve had them over a month now and I’d argue that they’re pretty indestructible. Couldn’t really ask for more from a teether/bath toy! Hands in the air for Gumigem! *You can find the Gumigem website here. They sell a few different variants of the Bubba bag and they would make great gifts. Gumigem also make a gorgeous range of jewellery which beautifully double up as teethers and something for your squish to fiddle with while you feed them. The spinner necklaces are my favourite. Previous No boys, I’m not dying…I’m on my period!